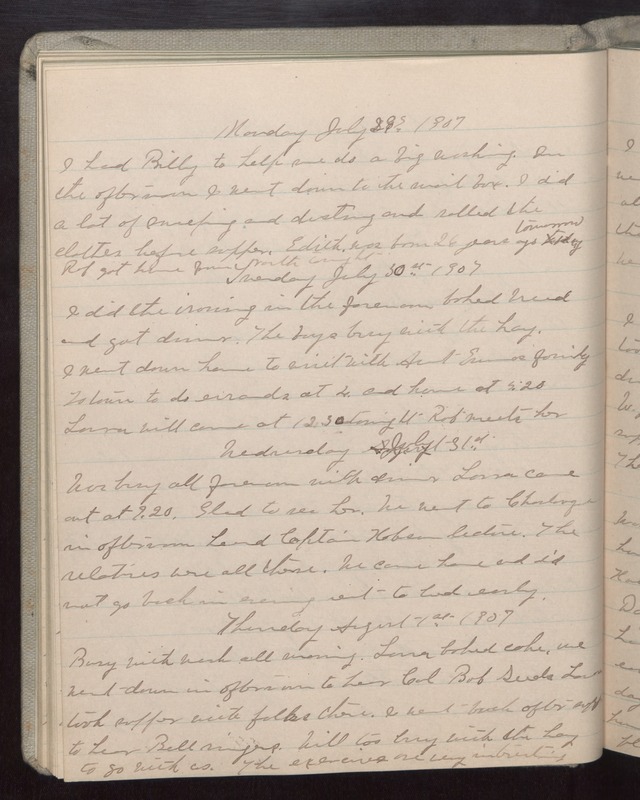 Monday July 29 1907 I had Billy to help me do a big washing. In the afternoon I went down to the mail box. I did a lot of sweeping and dusting and rolled the clothes before supper. Edith was born 26 years ago tomorrow Rob got home from north tonight. Tuesday July 30 1907 I did the ironing in the forenoon baked bread and got dinner. The boys busy with the hay. I went down home to visit with Aunt Emmas family To town to do errands at 4. and home at 5.20. Lorna will come at 12.30 tonight Rob meet her. Wednesday July 31 1907 Was busy all forenoon with dinner Lorna came out at 9.20. Glad to see her. We went to [illegible] in afternoon [illegible] Captain [Heben?] lecture. The relatives were all there. We came home and did not go back in evening went to bed early. Thursday August 1st 1907 Busy with work all morning. Lorna baked cake, we went down in afternoon to hear Col Bob [Scuola?] [illegible] took supper with folks there. I went back after supper to hear Bell ringers. Will too busy with the hay to go with us. The exercises are very [illegible].